You may prepare for a career in pastoral ministry, youth ministry, counseling, ethics, church history, and more. Check out the many opportunities by clicking here. Meet Dr. Gordon Isaac, Berkshire Associate Professor of Advent Christian Studies and Dean of the Chapel, Hamilton, Massachusetts campus by clicking here. Let Dr. Isaac know of your interest in Gordon-Conwell. Email him at gisaac@gcts.edu. They offer a number of campus locations. See them by clicking here. To apply, click here and select Future Students from the menu, select the campus of interest to you and contact the Registration Office. When you have been accepted by GCTS, you may apply for a Berkshire scholarship. 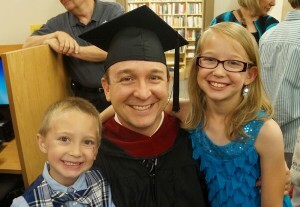 Chris at the 2015 graduation with children, Micah and Natalie. “My time at Gordon-Conwell Jacksonville has not only stretched me mentally and spiritually but has allowed me the opportunity to take what I have learned in the classroom and immediately apply it in the ministry of West Jax AC Church where I am privileged to pastor. The language courses have allowed me to read the Bible in a more vivid and exciting way. The leadership courses have given insight into how to motivate and encourage others. The courses in theology and church history have challenged my thinking on important topics while strengthening my faith and love for the Lord and His church. The classes I experienced addressing Advent Christian theology and history were especially enlightening and beneficial. The knowledge I gained from Dr. Isaac has helped me become a better pastor, especially a better Advent Christian pastor.